Last Thursday morning around 6am I left Galway after 3 days and nights of hanging around and seeing the sights. I met some pretty cool people in the process. When traveling it seems like those who travel always seem to end up together - something in the way of like minds attract. Anyways I left the place I was couchsurfing and headed for the bus terminal which would bring me to Dublin in about 3 hours time. It's right straight across the country. First time I can say that I've been across an entire country in one day. 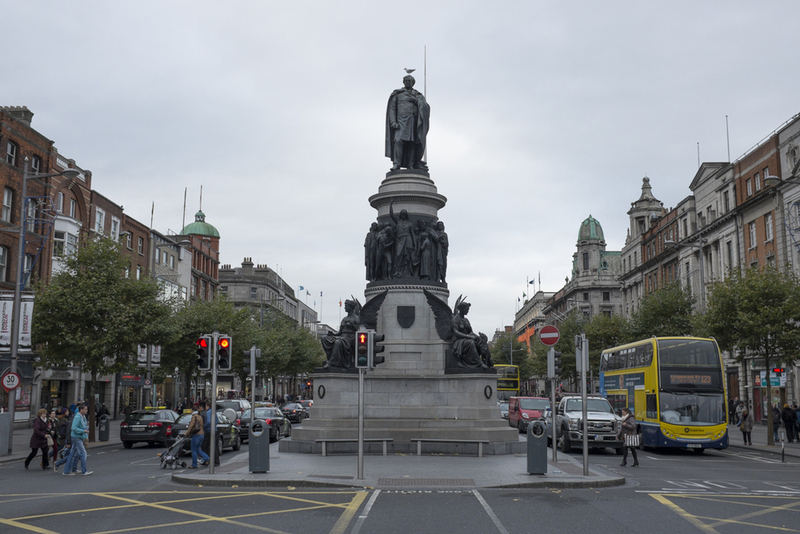 Upon reaching Dublin I noticed that its very different than Galway and the countryside sights that I had become used to. Its quite city like: metropolitan, diverse and much larger comparatively. 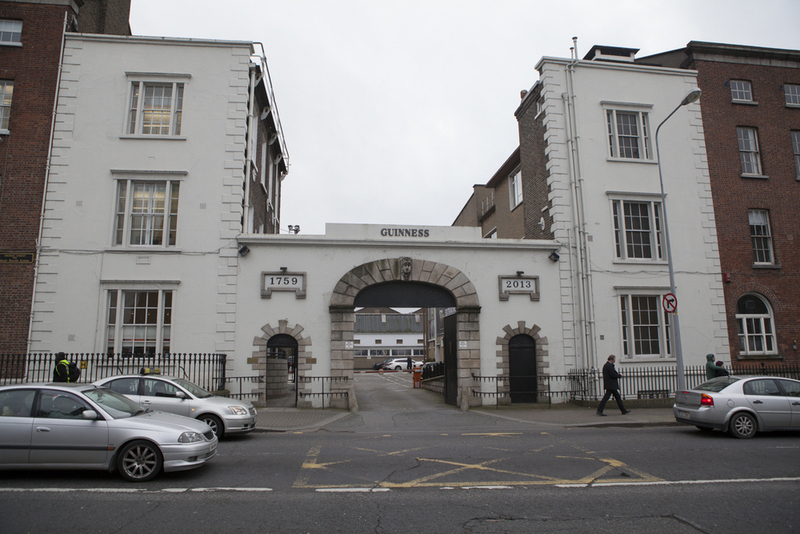 The pastel coloring of Galway had been replaced by rather cold concrete and muted colors. I checked my bags into left luggage at the airport and took the bus into town for about 7€ not too terrible as that pass also allowed me to use the city busses all day. The left luggage area was only about 12€ for the day. I got into town and was let off around O'Connell street. Coincidentally there was a statue of this O'Connell character - friend Jason (mentioned in an earlier post) said that this guy is his great-great-great Grandfather. So snapped a pic and sent it off to Jason. He'd seen it before a few years back when he visited but he was still psyched all the same to see it again. The current state of O'Connell is being overwrought with pigeon / seagull issues. 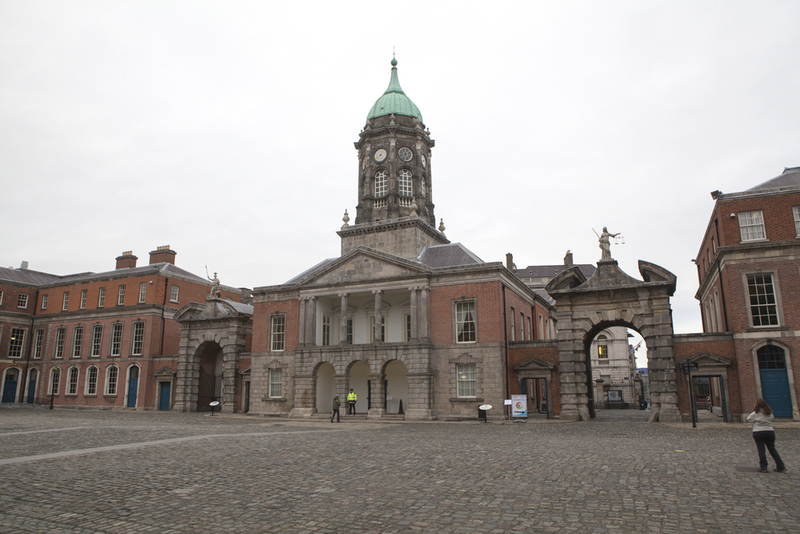 As you can see from the picture, Dublin at first glance looks European overall - similar building styles, not to mention that kind of dome shape on the building to the right. I might not go as far as comparisons to Parisian architecture but its on the way there nearly. 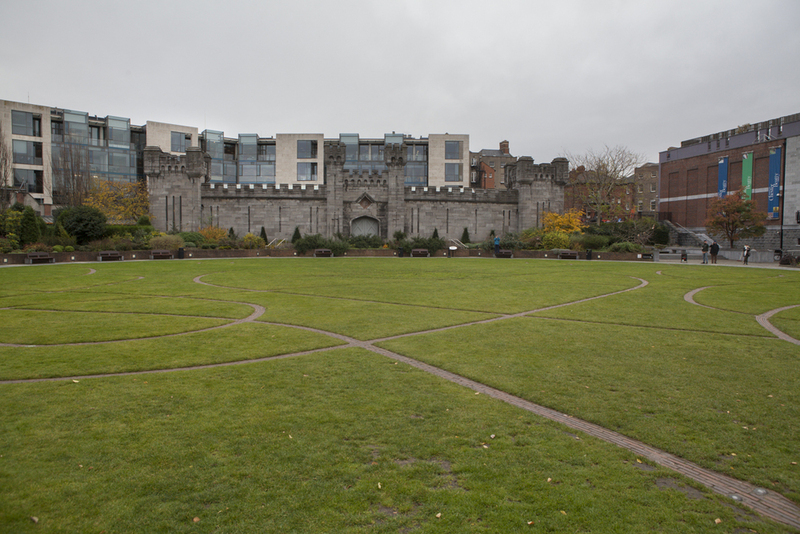 The first stop I visited was the old Dublin Castle, now used for parliament and government business. It was originally a Viking settlement then converted into a grounds when the British government took over. 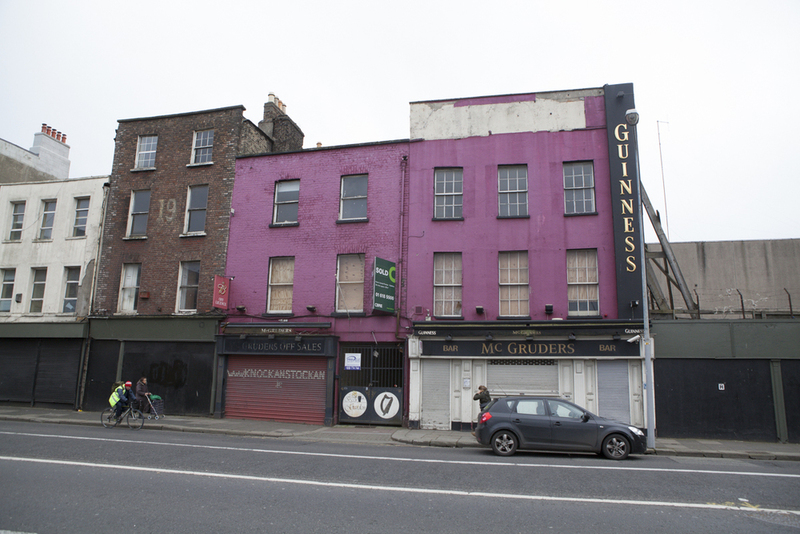 I had heard from a few people that I should check out the area down by the river as well - Templebar. It's a popular area to go, especially at night apparently but I wasn't around long enough to see it. There's lots of bars and stuff and I even came across a few art spaces, one being the photo archive, the National archive was also nearby. 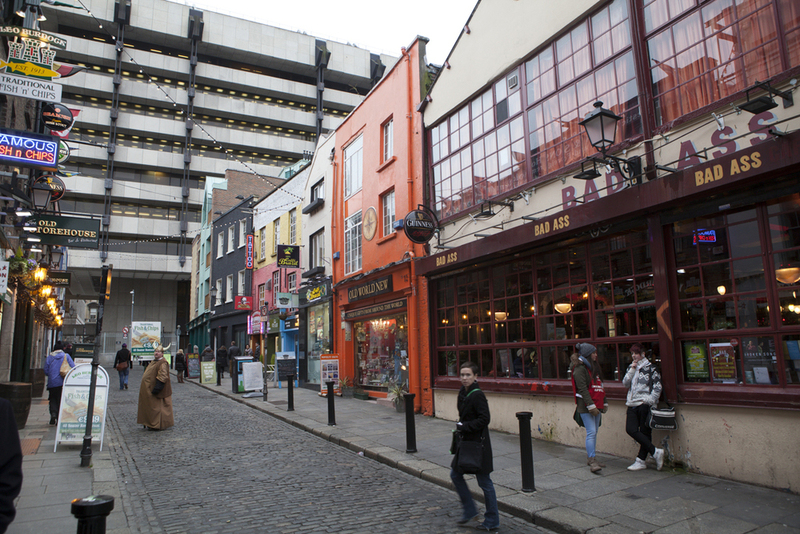 Temple bar area. The streets are small and cobblestone. There's this viking dude hawking chicken wings or something or other. 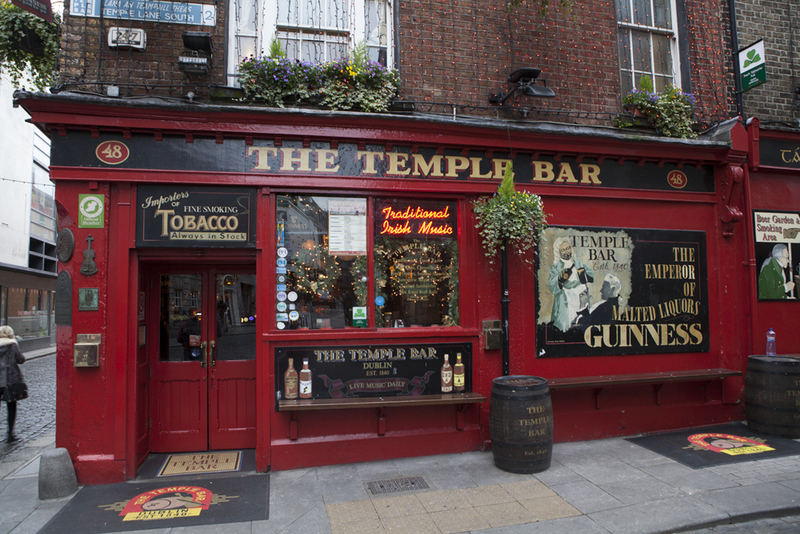 The veritable "Temple Bar" itself. 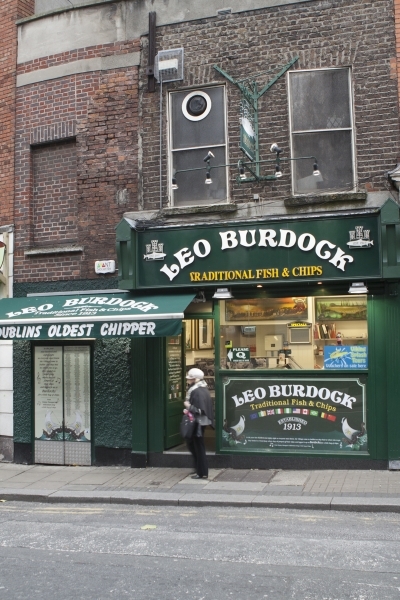 Oldest fish and chips place ever apparently. Though I've only had one meal of Fish and Chips so far. 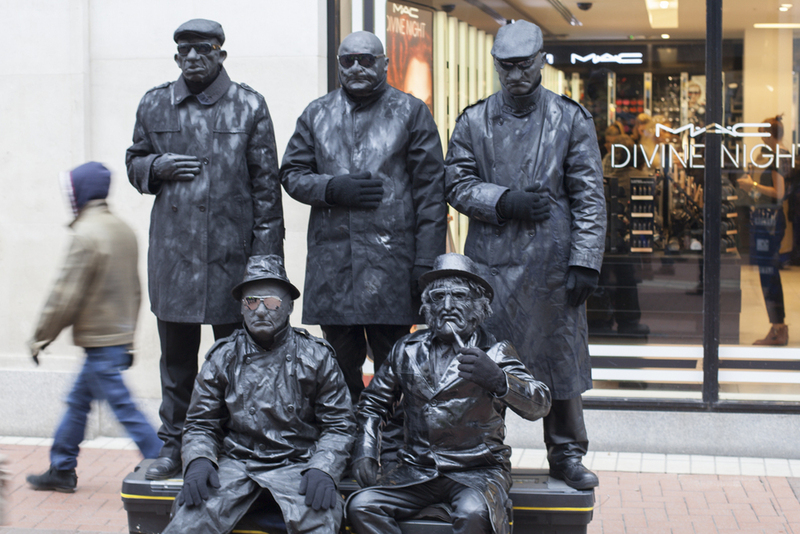 Street performers - not entirely sure what exactly they're performing other than a variant of blackface? This was near the photo archive which was sadly closed for an exhibition. After temple bar I headed for the Irish Museum of Modern Art which is about a 20-25 minute walk across town. 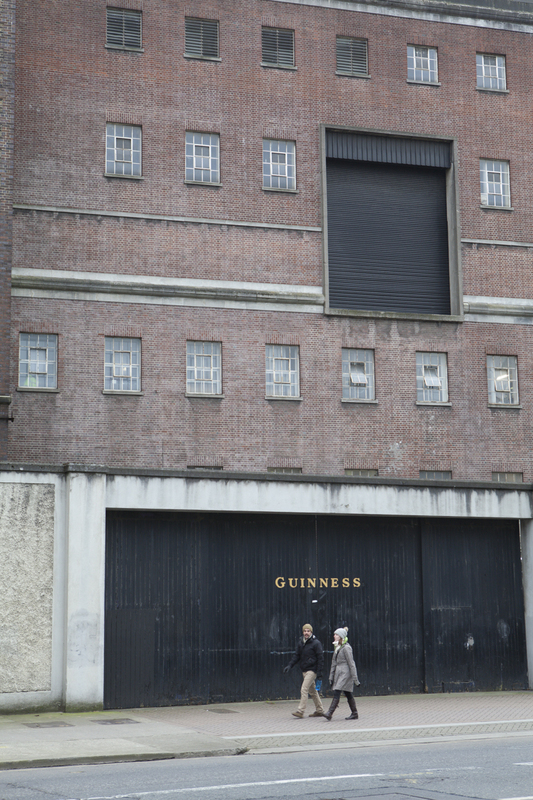 In that time I walked pass the Guinness brewery - costs 15€ to get in so I passed. I took a few pics along the way anyway. Quite a massive compound that takes up a few city blocks. This is nearby the brewery, the town seems a bit more run down in this area. This is the entrance to the visitors section (I think). Like I said the compound is crazy big so I wasnt entirely sure. I gave some Spanish girls directions to this though - seems like a legit point of entry. More sort of a stockade type looking building. 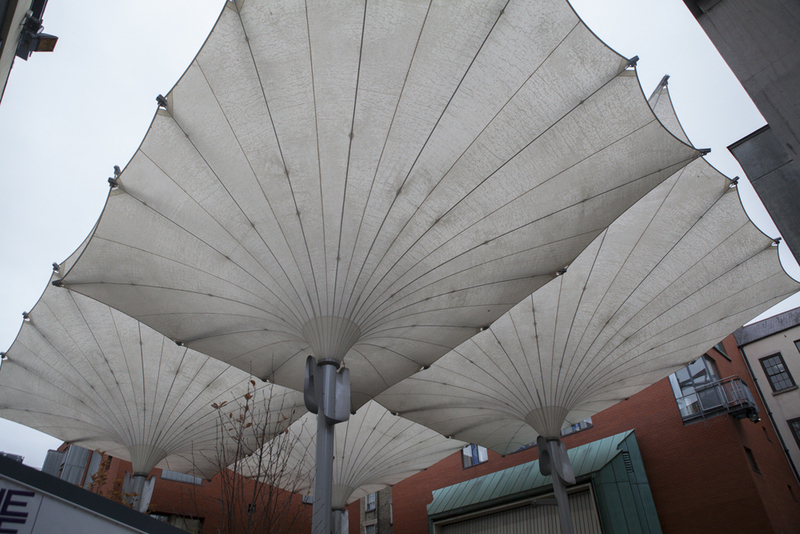 The art museum was well tucked into a kind of residential pocket of the city. There were quite a few blocks of flats I walked by till I nearly convinced myself I was going the wrong direction. Persistance paid however, as when I turned the corner it sprung out at me. The building is super nice. 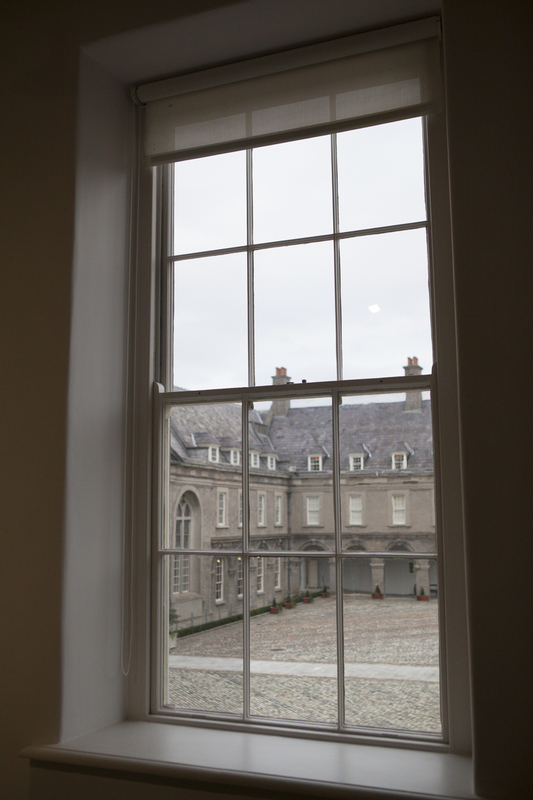 It's an old 17th century converted hospital, formerly Royal Hospital Kilmainham built around 1650. The museum has been there since 1990. 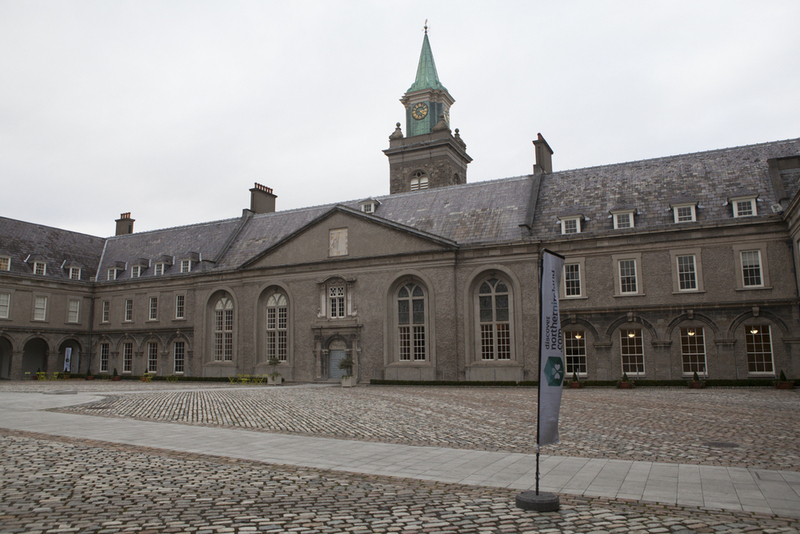 As you can see the structure is a really great example of 17th century architecture, and makes a great place to host exhibitions. The space was well utilized, they had a show on architecture, a collection show and one paid entry show of a contemporary artist. More info on here. Definitely recommended if you have a day or two in Dublin. Yea so after seeing the museum I caught a bus back to downtown and had a Guinness just to say that I did. I noticed a bit more froth (or maybe I just thought I did, not sure). Either way my appreciation for Guinness has like quadrupled since I've been to Ireland now. After the beer I caught the bus out to the airport on my way to London. Will be updating soon with my first post from England in the next day or so.